When I arrived the campus looked empty, only to discover that everything was being held in front of Founder's Hall. I thought it would be a campus wide thing ,but it's just the Animation Department. There where maybe 40-50 people including students, faculty, alumni, and guests. Here's how things played out. 12:00PM: Thing's are kicking off! I see Rick our department chair, food and Yan, a fellow animation student. 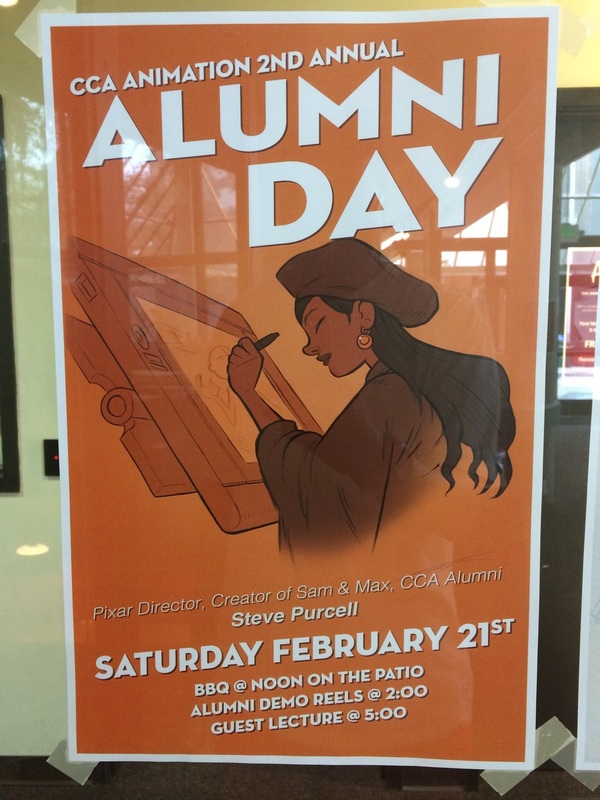 2:00-4:20PM: After a great BBQ cookout and finally getting to know the names of other animation students in my class; it was nice to hear about the ups and downs of life after CCA. I do however have the audio of the lecture for those students who couldn't make it posted below. Steve cover so much information from his beginnings to where he's at now and heading. Mostly, he emphasized that "every chance you get to work on a project... treat it like it is the only opportunity that you have to do it." He also gave insight into the various cultures of CCA, Pixar, LucasArts, ILM and other great moments to listen to. Enjoy!